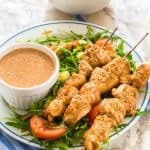 Almond butter chicken satay is a Thai inspired peanut free recipe where chicken pieces are fed onto a skewer, marinated then grilled and served with an almond butter dip. This Thai chicken satay is to die for and let me tell you why. I’m actually my rendition of south east Asian satay which would normally be made with peanuts. As this is paleo approved I took the liberty of spinning the recipe on it’s head by doing an almond butter chicken satay instead. In case you are unfamiliar with what chicken satay is, then let me inform you. 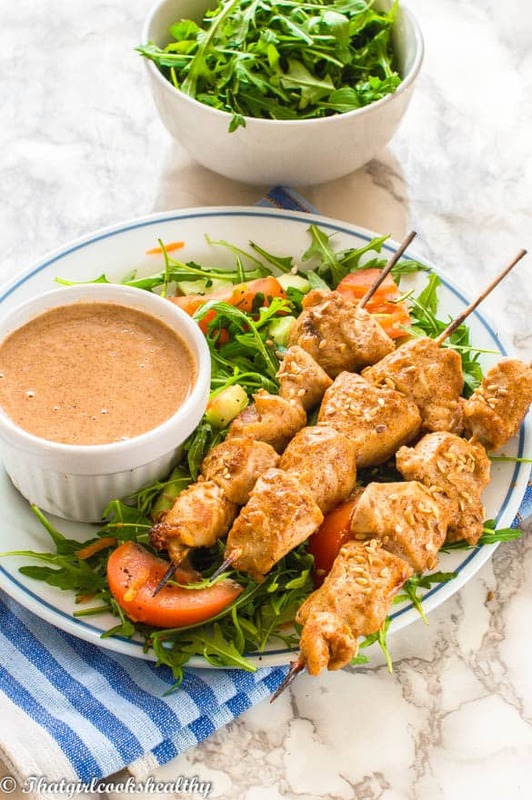 Chicken satay is dish where meat (chicken, beef or pork) is seasoned and then skewered where it is grilled barbecued and served with a dipping sauce. Although the origins of this dish connect to Indonesia, other south east Asian countries such as Singapore, Malaysia and Thailand eat this popular street food too which explain the title name. A male friend of mine who I went to college with during my late teens, invited me to a Thai themes birthday dinner he was hosting. At this dinner party I sampled some chicken satay and it was very succulent and tender. I had no clue what the dipping sauce was but found it addictive. The food at the restaurant was very authentic, I’d heard many reviews about this establishment and this was partly why I accepted the invite. 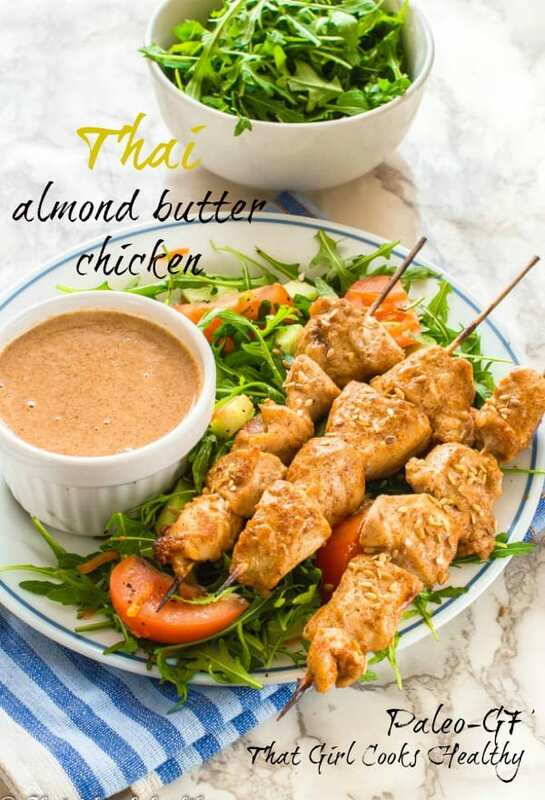 I knew one day I would love to make a peanut free version of satay chicken because I prefer the taste of almond butter and knew so many people who suffer from peanut allergies. 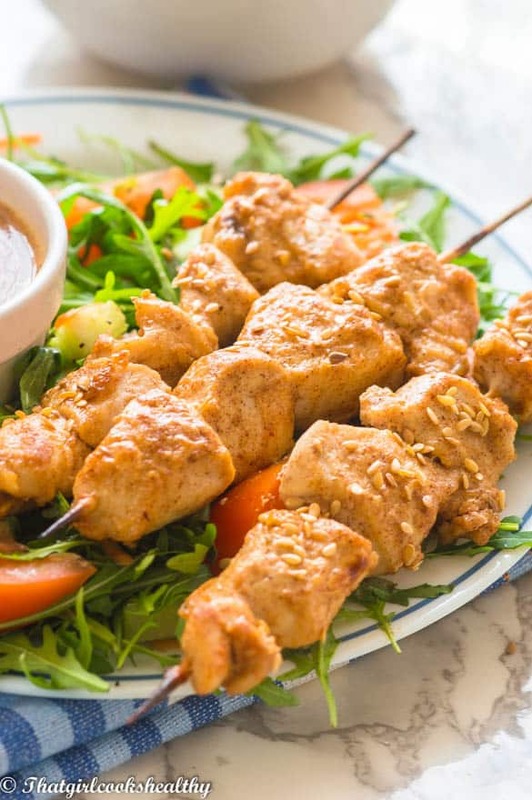 Are chicken satay skewers healthy? Chicken satay within itself isn’t unhealthy at all. The core problem with a lot of the east Asian food that’s sold in the western hemisphere is loaded with unnecessary fillers like MSG – a toxic chemical flavour enhancer and this saddens me as it gives a bad rep to Authentic east Asian food. When I visited relatives in Canada, there was a huge Asian community across the entire GTA (Greater Toronto Area). When I eat in these predominately Asian areas I could immediately taste the difference. It wasn’t salty or had an acquired after taste. When making Asian food it’s best to learn how to make it from scratch at home so you’re able to control what goes in it and not have to worry about MSG or other additives. This chicken satay was purposely made with almond butter as opposed to peanut so my paleo audience can reap the delicious benefits along with the gluten free crew. It’s succulent and tastes identical to the peanut butter version only legume free. The marinade – You’ll be pleased to know there isn’t a lot of prep and marinating going on – no overnight marinating (yahoo) yes I will let you off just this once. 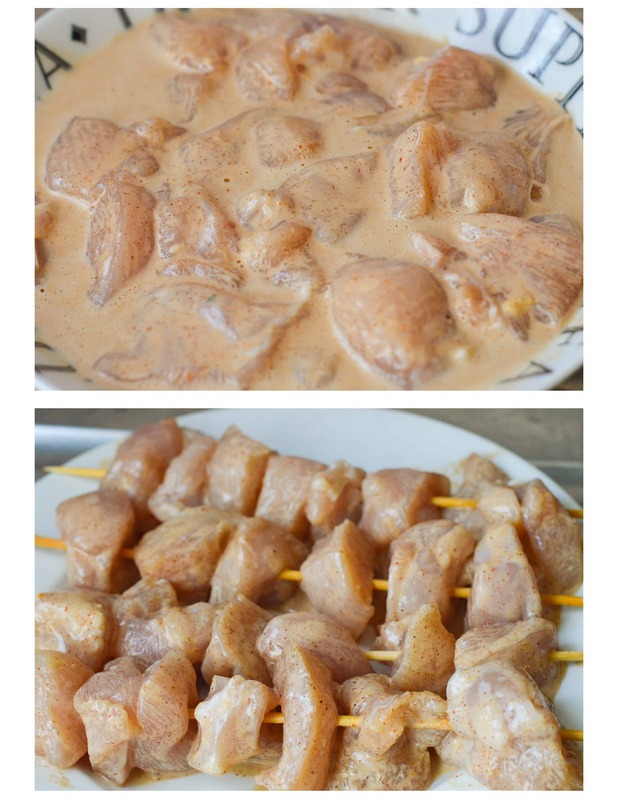 Satay skewers – make sure to feed each individual piece of chicken onto the skewer – metal or wooden. Save half of the marinade for the dipping sauce – yes the marinade doubles up – half for marinating and the reserved portion for a dip – two in one ain’t bad. 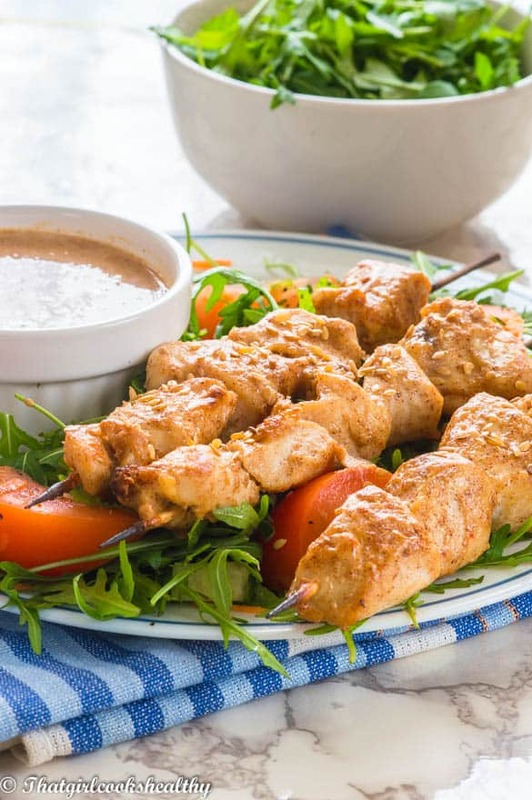 Grilling your chicken – I grilled the almond butter chicken satay to a fine crisp, if you luckily own a broiler than use as instructed. If not, it’s perfectly fine to follow my method of grilling both sides of the meat. Tastes amazing……try the dipping sauce……yummy!! Massage the pink salt into the chicken chunks in a bowl and feed the chunks onto each skewer leaving a few centimetres at the bottom of each skewer free to hold and set aside. Add all of the ingredients to a blender and blend into a smooth consistency. The mixture should be a smooth (not runny paste) this will thicken with time. Divide the marinade evenly, pouring one half of the almond sauce over the chicken to act as a marinade. Allow the meat to infuse and marinate for 1 – 2hours. Crack up the broiler/grill on high heat and grill the meat thoroughly on each side until both sides are golden brown. Serve with a side of veggies, dipping sauce or quiona (gluten not paleo option). Charlene, immediately I saw your post I had to rush over to check it out. I love your healthy twist to this popular appetizer. Great recipe! By the way what is coconut aminos? Thank you, Coconut aminos is made from the sap of the palm tree with unrefined seas salt. It’s healthier than soy sauce it is not processed and doesn’t unstablise the hormones. It’s a great choice for people who want to avoid soy. I never leave comments, but this was the most delicious thing I ever made. I’m not particularly talented in the kitchen, so 100% of the credit goes to you and your recipe, which I followed to a T. It’s testament to the fact that pallets of butter and barrels of sugar are no match for the right combination of bold flavors. That you made it paleo is even more impressive. Thank you for sharing your culinary genius. Aww thank you so much for your wonderful feedback Chad. I try to make my recipes as easy as possible to follow. This looks so delicious! I can’t wait to try! You are welcome and enjoy! !